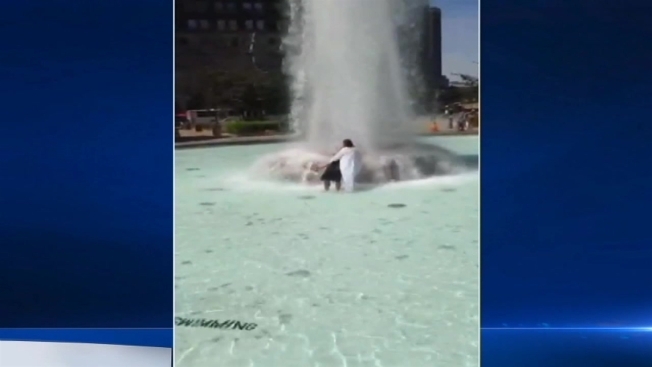 "This is not the first baptism I did at the fountain," said 28-year-old Michael Grant, who is often referred to as Philly Jesus, or PJ. "I do it everyday. ... like in a 6-hour day in LOVE Park, I probably baptize six or seven people." Thirty-year-old Dennis Herrera, of Staten Island, New York, spotted Grant -- dressed in a white robe and staff in hand -- while passing through LOVE Park Friday afternoon on his way to the Philadelphia Museum of Art from his hotel. Herrera is in town for the weekend with his girlfriend and brother, who captured the encounter on video. Grant, a recovering drug addict, embraced Jesus in his efforts to maintain his sobriety. He has been sober since June 4, 2013. "I considered myself completely healed and cured when I surrendered my heart to Jesus Christ," he said. While some may be offended by Grant's actions, he said the public "baptism" shows one's love of Jesus. "It is you making the conscious decision as an adult," he explained. "Jesus said anyone who acknowledges me in public, I will also acknowledge before my father and the holy angels in heaven." Grant led Herrera by the hand through the fountain before dipping his head beneath the water. The 220-pound man said Grant did not drop him, but he isn’t sure exactly how or why he fell to the water and then dashed out of the fountain. The Staten Island man said he was baptized in a church as a child, but has not attended mass in about six months. “I’m not the best practicing Catholic,” he admitted. Herrera -- unaware of the attention Grant has received in recent months – said he has a lot of respect for Philly Jesus after learning his story. “After I looked at the video and saw how sincere he was with his faith,” he said. “I respected him for it." As Herrera takes in other sites throughout the city, Philly Jesus will be in his usual spot in LOVE Park. "Repent," Grant said. "Come to the fountain to be baptized for the forgiveness of sin in the name of Jesus Christ." *An earlier version of this story incorrectly identified the fountain's location as the Swann Memorial Fountain in Logan Circle.